It's not every week or even every year that we get a brand new Smithsonian museum, so we're excited to announce that this week the grand daddy of all museums will break ground on the new National Museum of African American History and Culture (NMAAHC for short). It's also appropriate that the David Adjaye-designed museum begin construction during February, which is also African American History Month. 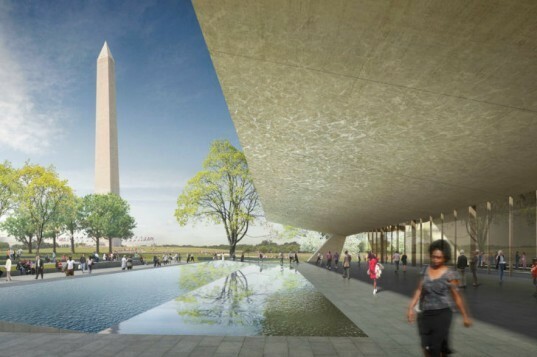 The new museum will be located just to the northwest of the Washington Monument and it will be a showcase for green building strategies. Adjaye is the lead designer on the project and is assisted by American firms The Freelon Group, Davis Brody Bond, and SmithGroup. 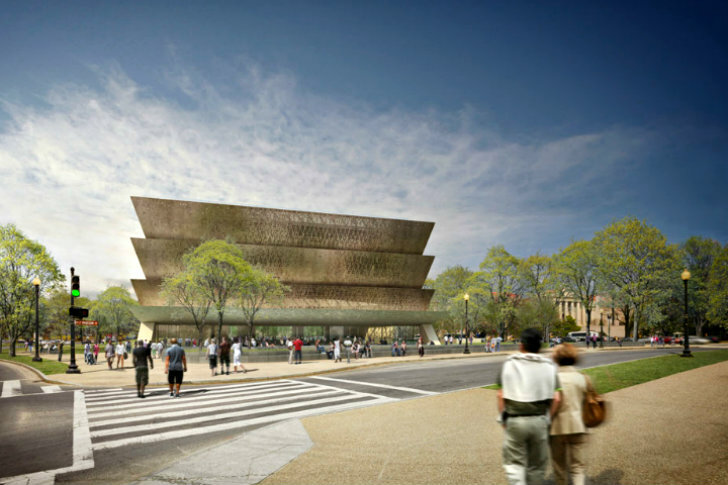 The Freelon Adjaye Bond/SmithGroup (FAB) team won an international design competition back in 2009 to design the new African American History & Culture Smithsonian Museum. The Ghanaian-born architect David Adjaye, with offices in Berlin, London, and New York, is the lead designer. The 350,000 sq. ft. museum will be devoted exclusively to the documentation of African-American life, art, history and culture with collections covering slavery, post-Civil War reconstruction, the Harlem Renaissance and the civil rights movement. The building relies on three cornerstones: the “corona” shape; the porch, which reaches out into the landscape; and the bronze filigree envelope. This bronze envelope will be perforated with a historical reference to African American craftsmanship and will work as a shade screen for the interior of the building and allow natural daylight to seep through. Skylights in the roof and atria will also work to bring in natural daylighting into the space. Sustainable design has been a high priority even from the beginning conceptual phases and will result in a building with very high green design standards. With ground breaking this month, construction is expected to continue for three years with a grand opening expected sometime in 2015. The Freelon Adjaye Bond/SmithGroup (FAB) team won an international design competition back in 2009 to design the new African American History & Culture Smithsonian Museum. The Ghanaian-born architect David Adjaye, with offices in Berlin, London, and New York, is the lead designer. The 350,000 sf museum will be devoted exclusively to the documentation of African-American life, art, history and culture with collections covering slavery, post-Civil War reconstruction, the Harlem Renaissance and the civil rights movement. The building relies on three cornerstones: the “corona” shape; the porch, which reaches out into the landscape; and the bronze filigree envelope. This bronze envelope will be perforated with a historical reference to African American craftsmanship and will work as a shade screen for the interior of the building and allow natural daylight to seep through. Skylights in the roof and atria will also work to bring in natural daylighting into the space. Sustainable design has been a high priority even from the beginning conceptual phases and will result in a building with very high green design standards. With groundbreaking this month, construction is expected to continue for three years with a grand opening expected sometime in 2015. Location of the new museum. Map of the Smithsonian museums and the location of the new NMAAHC. Location of the new NMAAHC on the Mall.